Day Four of pretending we know how to handle a cruiser made for eight people. So far the score is large sticky-outey trees 2, deck furniture and paintwork nil. One of the most peculiar (and pleasant) features of travelling without a set itinerary is when one happens across people with whom one has an in-built affinity. One supports the same football team, went to the same school, have a mutual acquaintance, etc. 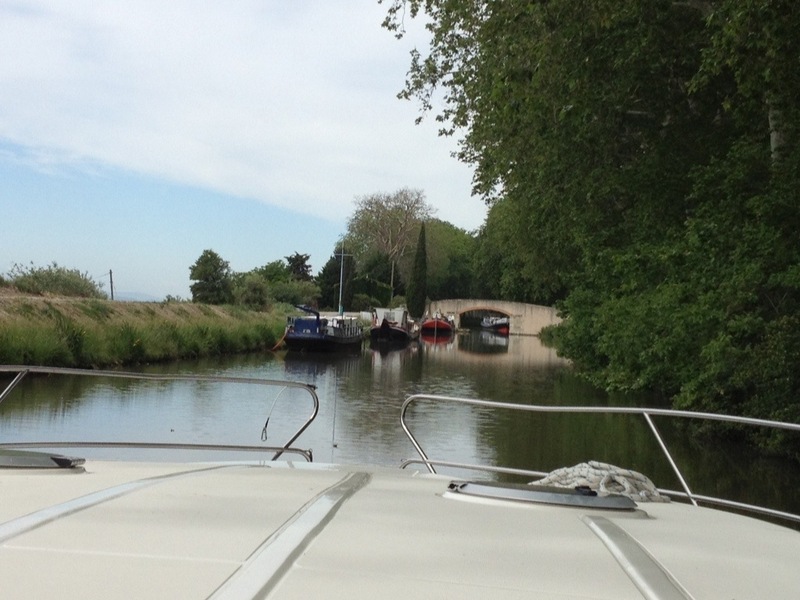 On the current exploration of Brittany, et après Le Canal du Midi, (bucket list – tick), we have met precisely three groups of fellow travellers who speak English … meaning that one’s schoolboy French has been getting a bit of a workout. Astonishingly, given that I grew up in Bournemouth and then went to University in Southampton, which duly became my adopted home before I eventually moved to Melbourne, two of the groups we met were from Southampton, and one from Bournemouth. What are the odds? Quite. Thus it was no surprise, really, when the drunken but cheery garbologist we were chatting to in a small bar in the ludicrously pretty village of Colombieres, where we had moored for two nights waiting for gale force winds to subside, suddenly announced to us in insistent French that there were two Aussies living just around the corner. Adopting a well worn practice he had obviously observed from English tourists, he simply kept saying the same thing louder and louder until we indicated we understood him, which we did, partly, but we were more concerned about our hearing, and increasingly troubled by his startlingly crossed eyes, which were becoming more manic by the moment. Anyway, he shot off out of the bar and we assumed, incorrectly, that he had gone walkabout to fetch said Aussies. He hadn’t, he’d just gone off on a slightly crazed walkabout, maddened by our inability to follow his ravings, one suspects. So a couple of beers later, we set off in the general direction he had indicated, hoping against hope to run into Les Australiennes. Why we would imagine for one moment that we would find them is just one of those inexplicable moments of confidence that occur when on holiday. 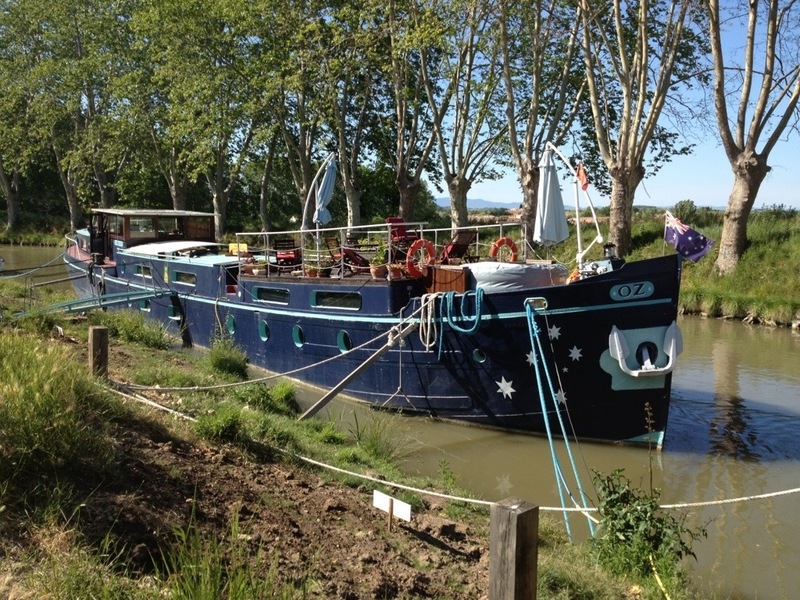 And as luck – or walking confidently – would have it, within five minutes stroll we came across a magnificently restored Belgian barge moored round the corner from the bar, with the unmissable name “Oz” and bestrewn with more than a few Aussie flags. A big sign announced it was a “bed and breakfast” establishment, so we rang the number on the sign. Of course they would want to meet us, we reasoned. 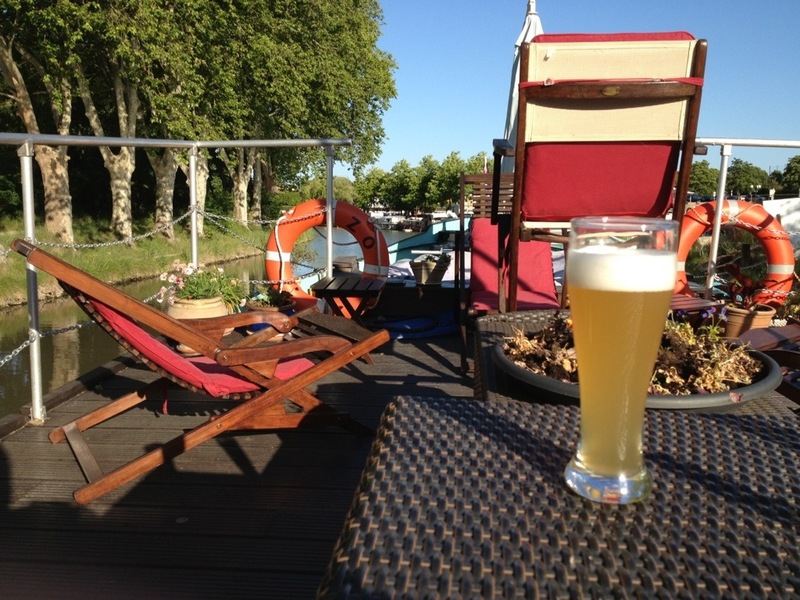 Fellow Aussies, marooned in deepest France Sud. When the phone was answered in an impeccable French accent, one was initially perturbed, then delighted, to learn that the owners were, indeed, Aussies, but that Dominique, of Dominique and Gwen, was actually a French Australian who had run bars in King’s Cross in Sydney, and who happened to count Jimmy Barnes as a personal friend, and who had returned to his homeland to pursue the quixotic but magnificent task of restoring the barge to her former glory. Unburdened by customers for a day or so, Dominique immediately bought us a beer back at the bar, gave us the lowdown on how to find a bus on the morrow to get into nearby Beziers (as we had decided the seven lock hill into the ancient town was a potential boat-wrecking step too far for our rudimentary bateuax-handling skills) and then offered to introduce us to the local winemaker, Louis, the next afternoon. Which is how we came, by and by, to be sampling Louis’ exquisite reds and rosés, accompanied by a running and vibrant discussion in Franglais on the relative merits of Australian and French wine. And afterwards, how we fetched up on the Oz, more than a little tipsy, to admire the astonishing renovation Dominique and Gwen had triumphantly pulled off, and to enjoy a meal of pork sausages, fricassied potatoes with garlic, and the most perfect champignons with more garlic and parsley, washed down with some more excellent local wine. No recompense would be accepted, Dominque was simply delighted to chat about the good old wild old days in Sydney, and for Gwen to enjoy the company of some dinky di fellow antipodeans. An utterly delightful time was had by all. Two things struck me in particular. Louis was, astoundingly, the eighth generation of vignerons to be growing grapes and crafting wines in the same location. His antecedents began the business back in the days of Louis XV. The family had survived Lord knows how many wars, depressions, insurrections, revolutions and the like, without ever losing their heads, or their wine business. Louis himself seemed to embody why – a man of strong but courteously advanced opinions, grizzled white hair, and amused pair of twinkling eyes, endlessly patient with our stumbling attempts to communicate, and fiercely proud of his own vision of how wine should be made. Without fining (cleaning the wine with egg white or fish to remove sediment), without preservatives to add shelf life but remove vitality, without a pre-determined formula and without storage in oak barrels, so as not to hide the complexity of the wine with mouth-filling dominant wood. Instead his wines were exquisitely nuanced blends of grapes chosen year on year to reflect local growing conditions. They revealed themselves in lingering finishes, gentle tannins, and unexpected flavours, and were, in short, an eye opener. In an instant we were transported back to an age when French wine had not succumbed to the pervasive styles of the new world, where brash Australians, Chileans, and Americans had not smothered the globe with identical massive Cabernet Sauvignons and meaty Shirazs that you could cut with a knife. Here was wine as sophisticated and as playful as the culture that produced it. Louis was polite about Australian output, but worried that our palates, beaten into industrial submission for a generation, could simply not appreciate his efforts. He was, I suppose, partly right, and partly wrong. We were surprised – challenged, even – but appreciative. What was most sad, though, was when he quietly said he thought there might only be four other winemakers in the entire region making small-run and near-perfect wines the way he does, with the feel of his gut, and hundreds of years of accumulated nous to guide him. 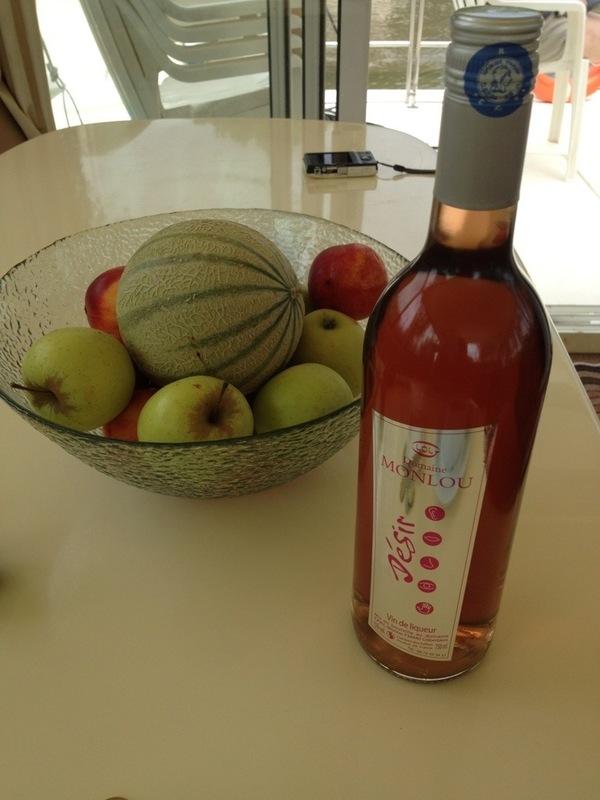 Especially when, reverently, we were introduced to his rosé Vin de Liquer, Desir. We were assured it was very alcoholic, but at 15%, we pondered, it was only a point or two above your average Aussie red. Quaffable. What was astounding was the vast complexity of flavours that exploded on the tongue. Sweet? Yes, on the sweet side, but with a crisp, balancing acidity too. It smelled of fruit … It smelled like the inside of a fruit shop, in fact, in which had been stacked fresh bales of new-mown hay. It was luscious in the mouth, but not cloying. It was, in short, a revelation. 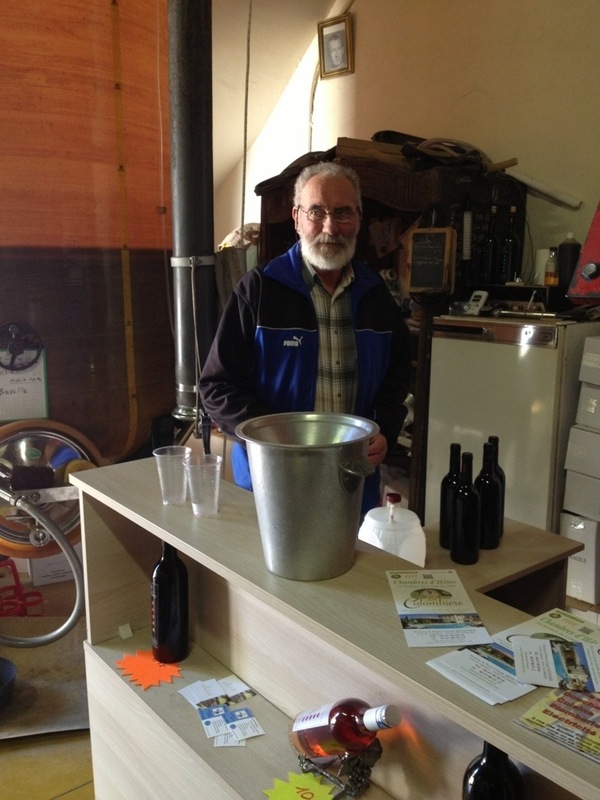 If this was what could be done with old-style wine-making, then vive les vieux! At just over ten Aussie Dollars a bottle, it was all Mrs Wellthisiswhatithink could do to stop me buying the entire output. The second thing to strike us in these meanderings was the remarkable force of a dream. The same dream that drove Louis to keep making wine the way his father, grandfather, great-grandfather, great-great-grandfather, great-great-great-grandfather, great-great-great-great-great-grandfather and great-great-great-great-great-grandfather had, impelled Dominique and Gwen to turn their back on well-paying jobs, and to turn, instead, this beautiful but battered old barge into a living labyrinthine beauty of comfortable berths and showers, with a glorious sitting and dining space up on deck, and transform it into a working memory of a more sedate and gracious time, when speed was most definitely not everything. After seven years, they gladly and cheerfully confirmed that Oz was their private money hole, into which they had poured savings that they knew they would never quite recoup, but which they also knew had meant the creation of one of the more remarkable places anyone, especially their fellow Aussies, could stay along their beloved Canal. Oh and by the way, should you drop by, Dominique is a prize-winning cocktail-maker too. Not that you’d be drinkers, an’ all, at all, Dear Readers. 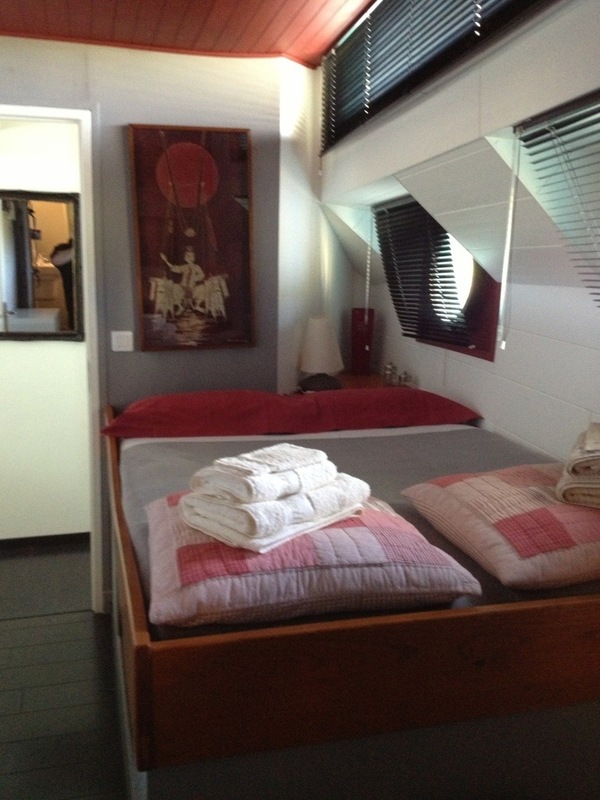 And Oz can be encouraged to actually move up and down the Canal with you on board, but honestly, I bet you ask for it to stay right where it is, moored two minutes walk from a superb Michelin-starred restaurant, not to mention a fifth-sixth century Church which has to be seen to be believed. If you’re lucky, like us, you’ll happen upon it just as a wedding arrives. And don’t be at all surprised to be asked to sit in and enjoy the ceremony. Especially when the locals discover you’re Australian, and not English. Delightful! I am forwarding this to two friends who are visiting France later this summer and in the fall.